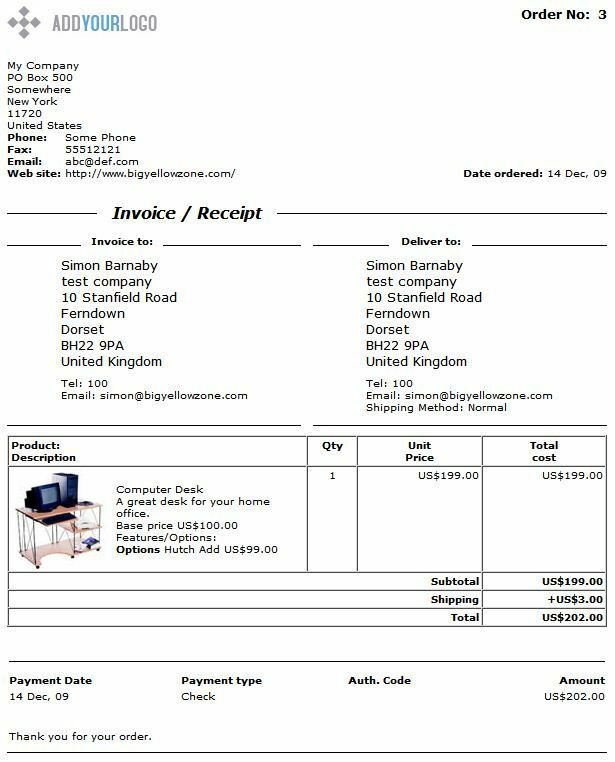 Invoice/packing slip/order confirmation can be previewed and then sent at the click of a button in admin and can be used in place of standard VPCart order confirmations. Includes much improved functionality, new features and is even easier to use. Design your packing slip based around our popular BYZ033 template fields bolt-on that is also is included in the package. Show all order items or an order summary. Add your site logo to the slip. Automatically prints your company details straight from VPCart. Customizable to fit all kinds of window envelopes or mailing wallets. Add a customizable heading / title. Add customizable text to the bottom of the slip. Prints country/state names in full as opposed to the country/state codes used in VPCart. Handles taxes (including UK VAT and Australian GST). 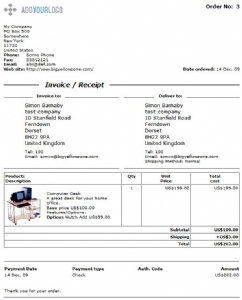 Customers can also print their own slip through the Customer Admin Screen. For supplier slip emails (which you can optionally use), it comes with 2 formats; one is the main supplier email template, and the other is an optional file attachment that you can send to the supplier attached to their email. This is so that, for example, you can display the info of the order in the main supplier email, and then have the supplier print off the separate attachment as a slip to put inside the package as an inventory list if your supplier is shipping the items themselves. For Bulk-Printing, the view-orders admin screen has a new section added to the bottom for bulk slip printing (you can turn this off if you wish via the slip config options). Select your criteria for printing, press the Go button, and it'll give you a popup slip window with all the relevant orders in slip format with a physical page-break between each order. You can then print-off all the relevant orders in one shot. Saves having to manually click one order at a time. By default, the bulk-printing facility will use the same search criteria that your view-orders page is using, but you can change it to use any criteria you like. This means that you can do things like showing paid-orders-only in the bulk-printing of the slip even when you're displaying all orders on the view-orders screen. 01 01-MAY-2004 Initial version - Big Yellow Zone VP-ASP Invoice/Receipt/Packing Slip. 02 04-OCT-2004 Added state description function. Moved line-item description formatting to a config file to allow for easier maintenance/customisation. Made fully compatible with V5.5. 03 24-NOV-2004 Added thumbnail image options to description field for order items. 04 10-JAN-2005 Added more product columns to be available to description field for order items (cdescription, extendeddesc). 05 11-JAN-2005 Changed shipping address logic to use shipping address when any shipping info has been entered rather than just the shipping name. The only shipping info not checked now is country and state as those may be defaulted to n/a or other default values for blank shipping addresses. Also, in the case of such shipping addresses being used, the name is now defaulted to the invoice name if the shipping name is blank. 06 08-MAY-2005 Corrections made to deal with large order/customer/product numbers etc (CInt to CLng etc). shopa_custpackingslip.asp and shopa_packingslip changed only. 09 03-JAN-2006 Made compatible with VP-ASP V6. Changed default format for line-items to use itemname instead of constructed string. Changed default footer text from blank to a thanks message. Changed default showthumbs to be Y instead of N.
Changed default for websessions to be used. Clarified and simplified the installation instructions. Changed customer-slip installation instructions to not replace the OID link and to instead create a new/extra link (so that downloads can still work by being able to link to the standard view-order page). 11 01-DEC-2006 Added facilities to send slips as customer and/or merchant html emails (eg for order confirmations/receipts). 12 04-MAR-2007 Clarified some installation instructions. Changed to be compatible with VPASP V6.5. 13 15-MAY-2007 Added extra columns which are now available on the per-item display logic, and configured those options. Moved tmyco_website setting out of main slip screen asps and into config options instead. Added new config options for the URL of the vpasp area, as this may differ from the mysite area if merchant doesnt want to display the cart directory in their mysite value. 14 11-AUG-2007 Added supplier html emails and corresponding attachments as new options. Fixed the feature logic so that it returns the caption as well as the chosen value. Changed all email slips (customer, merchant, supplier, supplier attachment) to default the item descriptions to a direct copy of the oitems.itemname value instead of the derived codes/names/features - this was so that when using usertext features the values are picked up correctly (for user-chosen feature values it would have been correct with the previous default settings, it was only user-entered values that had a problem). Changed supplier email logic to cater for null values for the suppliers details. Added customer/order other fields logic/display (related to the standard vpasp xcustomerotherfields, xcustomerothercaptions, xcustomerotherfieldsinorder config options). 17 12-DEC-2007 Changed merchant email logic to allow an option to set the from email adddress/name to the customers. 18 29-FEB-2008 Minor correction to Merchant and Supplier email slips; the shipmethod was being shown where the shipmessage should have been shown, thereby showing the shipmethod twice and the shipmessage not at all. This was only happening when there was a non-blank value in the shipmessage field for a given order. (the customer email slip was ok, and the screens were also ok). Created new config options for each type of slip to say whether to display the shipmessage or not and the corresponding label text to use for it. 19 10-MAR-2008 Changed to only attempt to process supplier emails if the xmailtosuppliers config option is set to Yes. Was previously trying to process supplier emails whenever a product being ordered had a supplier mapped to it. 20 23-MAR-2008 Added tax label configuration options, and secondary tax (for PST etc) options. 21 29-AUG-2009 Upgraded BYZ038 (from V08 to V10). Created version file for reference/info and took version numbers out of individual files. 22 07-SEP-2009 Added optional bulk-printing facility for admin screen slip. Step 10 of installation process amended to add 2 extra steps for the bulk-printing include/call on the view-orders admin screen. 23 11-DEC-2009 Changed to be compatible with VPASP V7. Split documentation into separate files. Upgraded BYZ033 (from V06 to V07). 24 13-JAN-2010 Corrected a bug which was causing problems when trying to send some slip emails for some mail types (for VPASP V7+). If upgrading, please note the new lines of code to setup the my_system variable in steps 16, 17, and 18 of the installation notes. Corrected Admin Screen Slip (VPASP V7+ only) to ensure product thumbnail urls are correctly calculated. 25 18-JAN-2010 Upgraded BYZ033 (from V07 to V08). 26 07-FEB-2011 Upgraded BYZ038 (from V11 to V12). Upgraded BYZ033 (from V08 to V09). 27 01-JUN-2011 Upgraded BYZ038 (from V12 to V13). Added charset meta tag to slip header html output (slip screens and slip emails) to allow special characters which were previously not working on some installations of vpasp. Changed cursor logic as some instances of vpasp were returning blank order-level values due to the 8K ado/sql restrictions. Added extra config options for optionally specifying fixed widths and/or heights for product thumbnails on all types of slip. For the list of effected files, see the version history (README_history.htm) file inside the slip zip file. 28 13-SEP-2011 Upgraded BYZ038 (from V13 to V14). Upgraded BYZ033 (from V11 to V12). More changes to help ensure that cursors never blank-out, and also added an extra bit of logic for the customer screen slip. Split some of the includes out of the VPASP V7 preview/resend slip email screens into a separate file so that it can easily be changed to use virtual paths instead of parent paths for the includes. Split the installation instructions into separate files for different versions of vpasp to allow for an easier-to-follow installation process. Please note: If upgrading from a previous version and if you are using VPASP V7 and your site/server does not allow parent paths, then please change the paths in the includes in the admin/byz_slp_admin_email_vpasp_inc.asp file to use virtual includes/paths instead of parent paths (see the installation notes for more details). 29 27-NOV-2011 Upgraded BYZ038 (from V14 to V15). Upgraded BYZ033 (from V12 to V13). 30 04-MAR-2013 Upgraded BYZ038 (from V15 to V23). Added extra logic to fix a problem where rounding and null amounts were causing error messages on some instances of vpasp. Changed the structure of the admin email submission screens to deal with later/patched versions of VPASP V7. Changed more slip functions to use BYZ038 functions where appropriate/possible to help avoid sqlserver bugs of cursors blanking out and to simplify/correct the logic/code/html etc. Added extra logic to work out the full urls of thumbnail images better in the slip emails. Added extra config options to the screen slips so that you can set an explicit logo image width and/or height. Took the payment authorisation code out of the customer screen and customer email slips for security reasons. Please Note: You must be using V23 or later of BYZ038 before upgrading to V30 or later of BYZ001. BYZ001 V30 or later will not work with V22 or below of BYZ038. 31 01-APR-2015 Upgraded BYZ038 (from V23 to V31). Upgraded BYZ033 (from V18 to V20). Minor corrections made to the html syntax that get pasted into the code via the installation steps.